Special Containment Procedures: SCP-1491 is to be contained in a standard humanoid containment cell. No additional special procedures are required. Non-destructive testing requests are to be submitted to the relevant responsible directing researcher (presently Doctor Richard Littlefield). Description: SCP-1491 appears to the naked eye to be a 46-year-old Caucasian male formerly known as ██████ █████████. 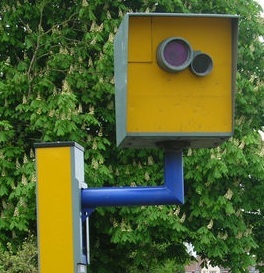 When viewed via electronic or photographic media, SCP-1491 appears to be a ███████-brand fixed speed-limit enforcement camera, mounted on a pole, with a combined total height of 3.1 metres. SCP-1491's anomalous nature became known during a review by local law enforcement of CCTV recordings in ███████████ town centre following an unrelated robbery. SCP-1491 was captured within its home following identification. Procedure: Subject in containment cell with no instructions. Subject viewed by eye and by video recording. Results: Subject observed by eye to be a human male, clothed in a standard issue Foundation humanoid SCP jumpsuit. Subject is observed sitting, pacing and sleeping. Subject observed by video to be a ███████-brand speed camera. Subject appears to move with no obvious means of locomotion, standing upright with the base of its pole sliding along the floor. Subject was observed to "hop" up from the floor to the seat of the chair, where it "sat" standing upright and immobile. Subject was observed laying rigid and immobile on the bed. Notes: Of particular interest to me is the rigid nature of the subject when sitting; what would have happened if the ceiling were lower? - Doctor Littlefield. Subject: SCP-1491. Clear Perspex box with lid, dimensions 1.5m x 1.5m x 1.5m. Procedure: Subject instructed to sit inside the box and close the lid. Subject viewed by eye and by video recording. Results: Subject observed by eye to climb into the box and sit cross-legged, closing the lid. Subject observed by video to hop into the box and close the lid. Notes: How a 3-metre-tall object was able to fit into a 1.5-metre-tall box without bending or folding in any way I just don't know. I can see it happen on the video, but I can't explain it. And the more I look at it, the more my eyes water. Passing this to the physicists. - Doctor Littlefield. Subject: SCP-1491. One small rubber ball. Procedure: Subject is instructed to pick up the ball from a table. Subject viewed by video recording. Results: Ball appears to jump from the table and hover in mid air next to the subject with no visible means of support. Ball lowers back to the table similarly. Subsequent inspection of the ball shows no anomalies. Notes: I start to wonder which to believe: my own eyes, or the eye of the camera. Is this a camera that we think looks like a man, or is this a man who fools cameras into thinking it's a camera? I'd pass this one to the philosophers, if we had any. - Doctor Littlefield. Subject: SCP-1491. One █████-brand car, belonging to Doctor Littlefield. Procedure: Subject instructed to stand beside closed test track at Sector-25 whilst the car was driven past at 130kph by Doctor Littlefield. Subject viewed by video recording. Results: Subject's infrared flash is observed to operate. Doctor Littlefield received a fixed penalty notice (speeding fine) letter from ████ █████████ Police at his home address four days later. Further investigation found appropriate Police records to match the letter, recording the offence as having occurred on the nearby ████ road. Notes: I was driving on private land! I'm not paying it. - Doctor Littlefield. Addendum: Doctor Littlefield has been advised that the result of test 4, though unanticipated, constitutes a minor containment breach, and that future tests of a similar nature should be avoided.